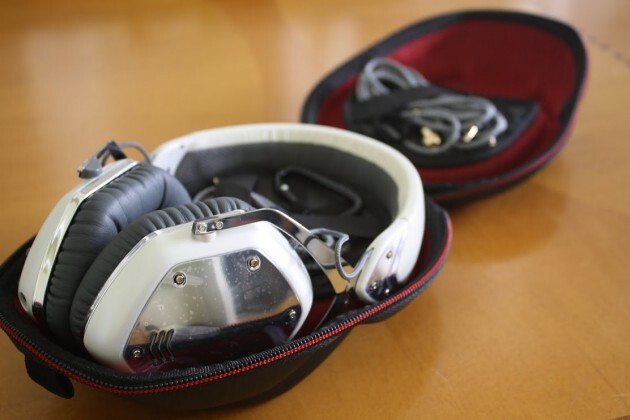 Today we put the old guard of the V-Moda product line through its paces: The Crossfade LP headphones. The Crossfade LP are the evolution of the original Crossfire M80 headphones that we reviewed back in 2012. Case and accessories – including that plastic protective coating we all love to peel! Rather than your run-of-the-mill tape to keep the box shut, a small satin-cotton ribbon encloses a form-fitting shell case… just a glimpse of the detail V-Moda have taken on the packing. Inside, the red-lined interior of the case houses the headphones and additional neatly tucked goodies on two elastic laden, velcro backed plates. The headphone comes in a choice of three colors: gunmetal, chrome, or pearl. 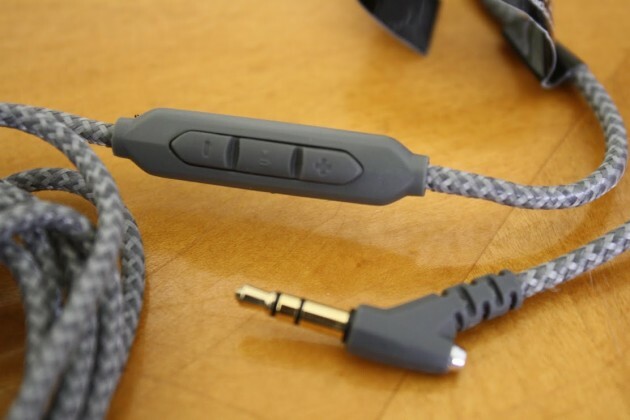 Two fabric-braided audio cables, one basic 6ft and one 3ft with in-line controls and mic for cellphone use, will keep untangled during normal use. A 1/4in audio adapter, carabiner clip and cleaning cloth are included as well. In all, it really is an impressive complete package—almost to the extent that you begin to wonder just how much of your purchase covered that portion alone. The headphones have a leather wrapped, minimally cushioned, headband. The inner foam cushion is lined in a mesh material that keeps things breathable and securely anchored to your head. 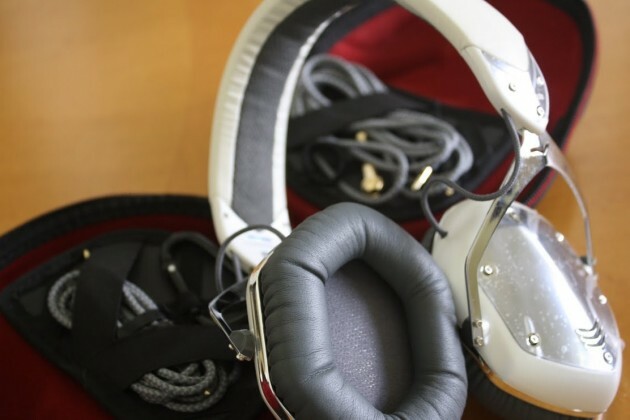 The earcups are quite comfortable—soft foam pads provide a memory-like feel. 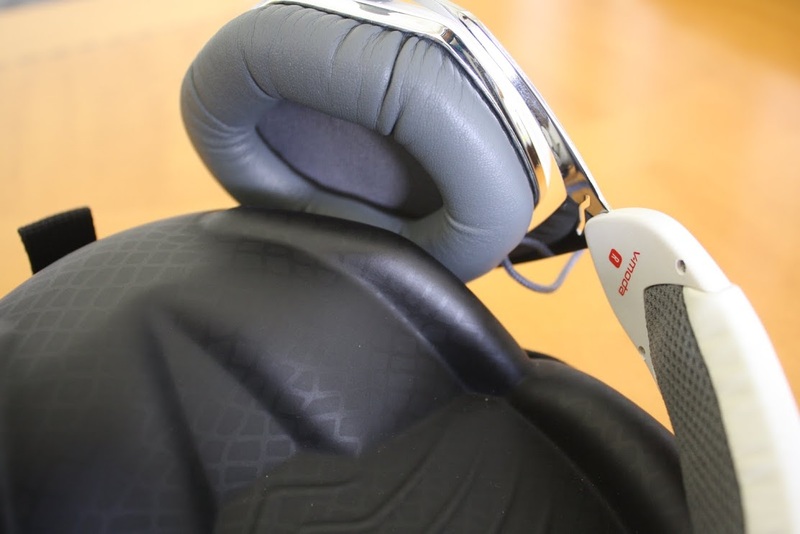 The foam here is wrapped in a soft leather that molds itself very comfortably, which does a great job of isolating the music from outside interference. The chrome-plated plastic accents on each earcup complete the “wow” factor. V-Moda allows you to design custom plates on their website to make them uniquely yours. Each earpiece freely rotates horizontally on dual hinges, but provides no real lateral movement across the headband. A solid metal frame joins the cups to the headband and loudly clicks into place as you adjust. The hinge and joint provide a premium feel, a welcome change from the often cheap and loose feeling plastic norm. Much like the chrome-finished plastic on the outside of the earcup, the metal here is an absolute fingerprint magnet. Fear not, that cleaning cloth comes in handy! So it looks great, is packaged wonderfully… but how does it sound? The ‘natural’ isolation of the earcup design subdued enough brown noise in my local coffee shop to keep me focused on this review. If there’s any downside to how the Crossfade LPs sound, it’s that they are very, very (very) punchy on the bass. It’s worth noting here that these are designed by DJs, developed by DJs and sold by DJs—they look and sound like they belong in a club environment. Predictably—dubstep, drum and bass, house and their similar equivalents sound great. Don’t get me wrong, the mid and treble of techno and dance are still there, but are easily overwhelmed if you’re not careful. Any sort of classical or vocal listening is going to require some EQ tweaks, but Jazz comes across just fine. This particular set of cans performed very well with the DacMagic XS, benefiting greatly from the mid/high boost that DAC provided. While the sound isolation works wonders when listening to music, talking on the phone with the included in-line mic cable can get you a few sideways glances. Volume control is provided, as well as a take/end call button that doubles as a pause/play during normal use. Inbound sound on most phone calls was a bit muddy, but the outbound was just fine—I’m going to attribute that to the the close proximity of the mic to my mouth, which is noticeably closer than most earbud/mic combos I’ve had in the past. Okay, so that gets music and phone out of the way, but what about gaming? Given the heavy bass sound these provide, they work very well in most game setups (particularly those with massive explosions.) Titanfall sounds incredibly satisfying, particularly during actual Titanfall or titan duels. Battlefield 3 tanking brought a smile to my face, as did building destruction and C4 explosions. I have to say even games with compressed audio benefits greatly from the additional bass, as well. In-game cutscenes and music really shine. Given the coin you’d drop on designated gaming headsets, the Crossfade LP provides a compelling alternative. Better still, the headset is travel-ready with the included case—oftentimes a secondary purchase needed for most gaming headphone setups. The V-Moda Crossfade LP headphones are a sonic boom, both visually and audibly. Overall sound quality suffers a bit when listening to certain types of music, but games and movies really come to life. Audiophiles will likely turn up their nose because of the heavy focus on low end frequency, but the average gamer will appreciate the million dollar looks and comfort the headset provides. With fun additions like customized earphone plates and add-on mics from V-Moda’s website, a functional form fitting hard case and handy included add-ons, this recently discounted set of cans has a lot to offer the everyday gamer.